This is the first Pro Elf featured here this season if I am not mistaken (I am too lazy to check previous articles) apart from the wanna be pro elf Idhrenmaedhdraug MTL from 2 weeks ago. Idalas does not have only fiery balls but as well balls of steel (or nerves, same thing realy). This helped him to score the first touchdown as he does not care about ball handling in the tackle zones. He fondled the ball several times more and scored one more touchdown, run with the ball firmly in his hands aplenty and even made a pass, with the ball. If you do not know what to write about, trying to put ball in every sentence is the way to go. For some reason unknown to me (as it clearly did not involve balls related activities), Idalas made as well 5 blocks and caused 3 armor breaks, which resulted in 2 knockouts and 1 casualty. The nerves (of steel) this elf has. Talk about being ballsy. Last week we had a Witch Elf who liked to talk to everything here and as soon as Darth Duran Duran heard of it, she had to show off as well. Her team is sitting on top of the division and has the playoff spot nearly locked up. Baring some very unfortunate results in last 3 games and some absolutely flawless games from Teenage Ninja Rats. And Darth Duran Duran played pivotal role in this success. She scored 2 out of 3 touchdowns of the game and leveled once more. And she rolled AGI stat up. 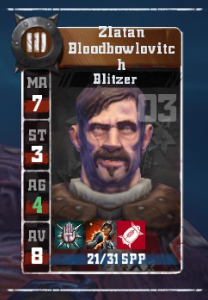 So now the team with Mighty Blow Blitzer, 3 guards and AGI5 Witch is properly disgusting. This is team to watch for. 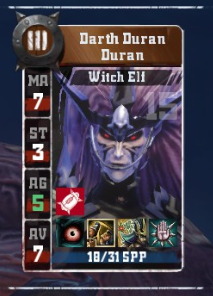 Apart the touchdowns she blocked 3 times resulting in 1 armor break. And she had to make 1 pass and 2 catches. Only surprise she did not surf anyone but even Witch Elfs have their limits. Finnaly, this week we have some human players appearing here again. Last season we had plenty of occurences from Oomies until they got inevitably murderized in DIV1. So it is nice to see some fresh human blood(bowlovitch). ftjust and his team were on top of division last week and mostly thanks to Zlatan who left his mark on the poor Brettonians. Especially on the poor peasant Simeon who got killed by the first punch of the game. He is at better place now. Zlatan continued with his murederous tendencies and looked up for more tasty target. It happened to be Blitzer Bejamin in turn 3, who can be glad he ended up only badly hurt. His 3rd and final casualty came in turn 10 when he badly hurt the brettonian ball carrier and ensured the 2-0 win for his team. Overall he broke armor 9 times in 14 blocks and apart the 3 injured he knocked out one more and surfed one too. Last week Harringzord mentioned that the fantasy league benefits mostly skaven blitzers, as they keep winning the Player Team Of The Week. After looking back at this season I had to admit it, since 5 ouf of 8 winners were skaven blitzers or underworld blitzers. And it was only due to the below Human blitzer going crazy on passes this week that Neeer of Itchy did not end up first reinforcing their superiority in this competition. Ravens Claws met Da Waagh Tigerz coached by Manus Atra. 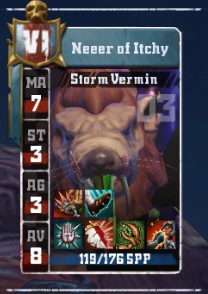 There is a term around REBBL - getting manused - which means your team getting utterly destroyed. It was coined After Manus'es orcs suffered huge losses in one match last season. This season the history repeats. Neeer dispatched of the Piling On, Jump Up Black Orc Grubnash WaaghChief with 126 SPPs and fresh lineman. They will be remembered. Well, maybe not the lineman. He caused 3 more casualties and one of them resulted in another niggled Black Orc. Add one knockout and Neeer inflicted 6 removals. All that in 11 blocks and 9 armor breaks. 28 fantasy points is the 2nd most I have seen since I started to name and shame the best players in this article serie. I remember Cash Crew Part Deux from the previous season, but when they got completely killed in the DIV2 last season J.J Cash decided that it is time for their 3rd iteration. And while the team is officially Human team, it seems like the coach is trying to secretly infiltrate some elfs into their ranks. 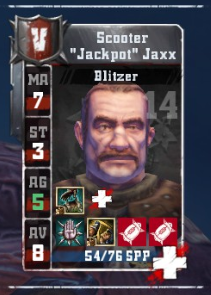 4 of them are sporting AGI4 and Scooter hit jackpot as his nickname suggests, and is now AGI5 Blodge Surehand blitzer. 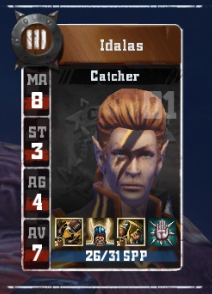 I am trying 3 seasons with elfs to get AGI5, and nada, and this fresh Human team is really irritating me. On top I of it I have a feeling that Scooter broke a record. While scoring 2 touchdowns and causing 1 armor break in 1 block he did 8 passes just by himself. After Razta found a fantasy point loophole, J.J Cash utilized it to its full extend. Now please stop and go back to normal coaching.